Female hairline lowering can be accomplished easily thanks to FUE or FUT hair transplant. Many women have a high hairline due to genetics, male patterned hair loss or other surgical procedures. A hair transplant is an effective way to permanently reshape or reposition a female hairline from a masculine, or receded one, to a more feminine and attractive hairline. Women who have a family history of high hairline in other female members of their family can usually identify other women in their family who had a similar hairline. This pattern could be inherited from either side of the family. These women are the best candidates for a hair transplant. Despite having a high hairline, their need is limited to the frontal areas of the scalp. Their donor hair is always intact and can support a good number of grafts to be transplanted. Despite its name, male patterned baldness is not limited to men. In fact, most women who suffer from patterned baldness present androgenetic alopecia or male patterned hair loss. 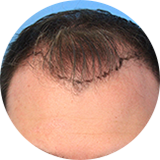 Women with male patterned hair loss recede their hairline and present with a very high forehead. The corners on both sides will be more receded than the central areas of the front and will look like a man’s face. These women are usually told they look better with a hat or scarf or when they wear bangs to cover their masculine hairline. We usually request lab work before a hair transplant to rule out other medical conditions and to start using androgen blocking agents if they have elevated testosterone. High hairlines can be caused by plastic surgeries such as browlifts or facelifts. These procedures may leave a scar in the hair bearing areas of the scalp in addition to losing temporal and corner hairs that may not be reversible. Hair transplant can be used to restore hair inside the scar or the surrounding areas that have been lost secondary to the surgical manipulations. A hairline can be lowered by transplanting healthy follicles into the hairline area. The artistic approach for creating a natural looking hairline is crucial. Special attention should be given to the direction and distribution of the transplanted hair. Every hair should be placed by considering the direction, curvature and distribution of native hair in the area. Designing a new hairline for a woman who never had a natural hairline is very meticulous. A hairline should be designed by considering the proportions of the entire face. A natural hairline makes the face more proportional and brings balance and harmony to the face. Some patients may bring pictures of women with perfect hairlines. If the structure of the face is similar, it is possible to recreate those hairlines. At times, we may recommend a different hairline after examining the other components of your face and determining which hairline looks better on you. Women who undergo a hairline lowering procedure due to patterned baldness or previous surgeries may also decide to make their hairline more attractive than what they originally had. Adding lateral humps (protrusion of hairline on the sides) and widow’s peak (forward advancement of the center of the hairline) may add character and charm to the faces of some individuals while helping to better frame their faces. Different hair is used to restore different areas of the hairline. Both FUE or FUT could be used to harvest hair from the donor area for a hair lowering procedures. FUE is the procedure of choice for women who don’t want to have any pain after the procedure or a scar on the back of their head. One hair transplant procedure is usually enough to define the new hairline and establish it in a new location. Some women may need to have another hair transplant procedure six months after the first one for better hairline definition. Women with coarse hair get better density and fullness with one procedure. If the hair shaft is fine, another procedure may be needed to add density and create a more solid hairline. If a second procedure is needed, it should be performed six months after the initial hair transplant. Surgical hairline lowering is an alternative procedure that some women may choose. This procedure removes a strip of skin from the upper portion of the forehead and, by doing that, lowers the hairline. This surgical procedure has a quick effect and, unlike hair transplant results, the lowered hairline could be noticed immediately after the procedure. A few disadvantages of surgical hairline lowering are that the scar will be noted in front of the hairline and the presence of a linear and unnatural hairline. Some patients may need a small hair transplant procedure to break down the straight line of the hairline and to hide the linear scar in front by putting a few hair follicles in the front of their surgical scar. Initial healing after a hair transplant takes about 3-5 days. Some redness and scabbing might be present for the first 5 days. Special washing is done in our office the first day after your hair transplant. We provide a post-op kit that includes a special shampoo and sponge that can be used at home after your procedure. There might be some swelling and redness on the transplanted area and forehead. Many women choose to wear their bangs over the transplanted area or they may choose to use a hat to cover the transplanted areas for the first few days. Hair transplant results can be seen after the first three months but it takes a few more months for the new hair to grow longer. The results of a hair restoration procedure to lower the hairline follow the typical pattern of other hair transplant procedures. The results are usually seen 8 to 12 months from the time of the procedure. The full appearance of the new hair is seen when the hair is long enough and can be combed and styled.